All Points 85-1107 Steel Reinforced Epoxy Putty - 4 Oz. Steel reinforced; makes steel-hard repairs in 20 min. This All Points 85-1107 steel reinforced epoxy putty is perfect for sealing, bonding, and repairing a wide variety of surfaces! 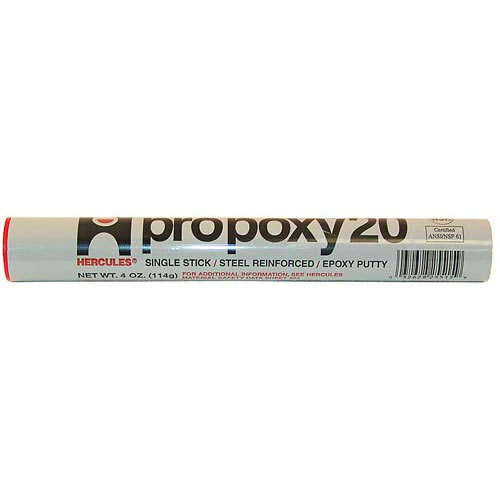 This 2-part, fast-acting epoxy comes in a single 4 oz. tube and the solution is steel reinforced for an extra-hard seal with superior temperature resistance, compression strength, and tensile strength. Use it on metal, masonry, wood, glass, ceramics, and most plastics; it will even hold up under water! Best of all, it can be drilled, sanded, filed, and painted once it has cured.